05-07-2016 : Plus Two Curriculam Change Latest News in todays Dinathanthi Newspaper. The newspaper says, Change of the Plus one, Plus Two Class Syllbus and books is under the consideration of the Tamilnadu Government. The Government plans to change the 11th Standard Syllabus/books from next academic year 2017-2018 and 12th standard Syllabus change from 2018-2019 academic year onward. The official announcements regarding this yet to be notified. The newspaper states that the syllabus for 11th and 12th standard were changed 10 years ago. And the news article gives openions of some important educationalists seeking to update the syllbaus of Higher Secondary Subjects coping with modern technological developments. 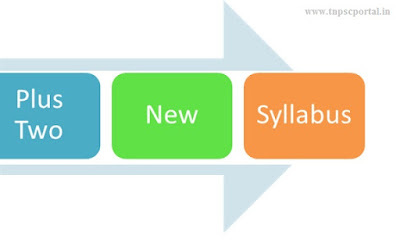 The present syllabus which is in use was implemented in the year 2007 . Since, the syllabus was prepared in the year 2005, now almost 10 years are over. Usually, all syllabus in School Education are renewed every five years. In the year 2012 , TN Government has set up a committee under Prof. Nagabhusanarav to prepare new syllabus for Plus Two . The same was prepared and kept open for public openion and sent for Government's approval. Today's Dinamalar Newspaper article states, a new committee may be formed again to finalize the Plus Two Syllabus. Tamilnadu Government has decided to change Syllabus for 11th and 12th Standards. There was a committee appointed for the revision of the books of Plus One and Plus Two Classes. The committee was headed by Prof.Nagabushan Rav, former professor in Anna University. There were sub committees appointed 25 subjects. The Expert Panel, headed by Honorable Higher Education Minister P.Palaniyappan has approved the New Syllabus Pattern prepared by the Prof.NagabushanRav Team for the Plus One and Plus Two Classes. When will the Book Preparation Work Start ? At present the new syllabus has been approved by Expert Panel headed by Honorable Higher Education Minister P.Palaniappan. Now the syllabus is sent to the Government for approval. Once the government approves the new syllabus pattern, the book writing works will be started. When the New Syllabus to be implemented ? After the approval of the New Syllabus by the Tamilnadu Government, it will take about 10 months for preparation of the books and correction / editing process. So the Plus One Standard Books are expected to be implemented from the academic year 2015 -2016. The Plus Two Standard Books to be implemented from the 2016-2017 academic year onwards. There was a new subject Engineering Mathematics for first group students.There will be major changes in the Physics, Chemistry and Biology Subjects also.